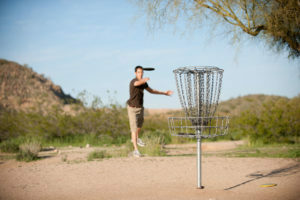 It’s a beautiful day outside and you’re celebrating by hitting the disc golf course. You’re in the middle of a great round when: bam, you tear up yet another pair of running shoes. Unfortunately, disc golf is well known for eating up shoes. Running shoes may be comfortable to play in, but the constant planting, rotation, toe dragging, and concrete tee pads can quickly destroy these types of shoes. After a couple rounds, you’ll blow out the sides, find the fabric coming undone around the toes, or wear down the tread quicker than you can say Jack Robinson. Sound familiar? If you’re tired of cycling through pairs, it may be time to consider a shoe that’s designed to play on the uneven rocky terrain and dew-covered fairways that you play on. From cushioning to support, waterproofing to weight, there are many factors to consider when looking for a new disc golf shoe. Comfort is the ultimate factor, but you also need to consider your early morning rounds with dew-covered grass, how the shoe supports your foot during the miles of walking, and the all-important grip strength on any surface. You need a shoe that will blend comfort and functionality to keep you going no matter what the weather or the course conditions throw at you.